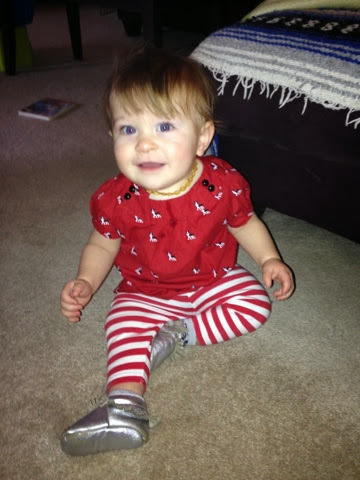 Baby Gap top, Mini Boden leggings from Moxie Jean. Freshly Picked moccs purchased at 30% off at the end of the season. Before I had kids, I never thought I’d care very much about what they wore. Clothes are clothes, they are just going to destroy them anyway, and all that nonsense. The reality is little girls’ clothing is freaking adorable and if you know where to look, you can find great clothes for good prices and have some darling little ladies toddling around in your life. My favorite place to shop for the girls is Moxie Jean, an online consignment shop for kids and maternity. Their tagline is “upscale resale” and they really stay true to it. Without this store, I would never be able to afford Tea Collection dresses and Mini Boden pinafores and corduroys. They sell top brands for amazing prices and the best part is that you can order a seller bag for FREE. Send them your best stuff and they will send an email detailing what they accepted and what they will pay you for it. What they don’t accept gets donated to children in need. You even get an extra 25% if you take your payout in store credit. Then there’s babycheapskate.com. This website has daily alerts for all kinds of deals, including “lowest price ever” deals on Amazon and many of my favorite brands. Since following Baby Cheapskate on Facebook, I have found 70% off on Hanna Andersson, Tea Collection, and Mini Boden. One click to like the page on Facebook, and you can thank me later for the savings. Retailmenot is a website/app that I go to regularly for promo codes. I almost never complete a sale online unless I can minimally get free shipping. Usually you can find 10-15% off your purchase if you sign up for emails. Set up a “junk mail hotmail” account and let the savings fly!